1 And the LORD appeared unto him [Abraham] in the Plains of Mamre, as he sat in the tent door in the heat of the day;	א וַיֵּרָא אֵלָיו ה’, בְּאֵלֹנֵי מַמְרֵא; וְהוּא יֹשֵׁב פֶּתַח-הָאֹהֶל, כְּחֹם הַיּוֹם. 2 and he lifted up his eyes and looked, and, lo, three men stood over against him; and when he saw them, he ran to meet them from the tent door, and bowed down to the earth,	ב וַיִּשָּׂא עֵינָיו, וַיַּרְא, וְהִנֵּה שְׁלֹשָׁה אֲנָשִׁים, נִצָּבִים עָלָיו; וַיַּרְא, וַיָּרָץ לִקְרָאתָם מִפֶּתַח הָאֹהֶל, וַיִּשְׁתַּחוּ, אָרְצָה. 3 and said: “My lord, if now I have found favour in your sight, please do not pass, I pray you, from your servant. ג וַיֹּאמַר: אֲדֹ-נָי, אִם-נָא מָצָאתִי חֵן בְּעֵינֶיךָ–אַל-נָא תַעֲבֹר, מֵעַל עַבְדֶּךָ. 4 Let now a little water be fetched, and wash your feet; rest under the tree. ד יֻקַּח-נָא מְעַט-מַיִם, וְרַחֲצוּ רַגְלֵיכֶם; וְהִשָּׁעֲנוּ, תַּחַת הָעֵץ. 5 I will fetch a morsel of bread so that you can refresh yourselves; then you can continue on; after all, you have come to your servant.” And they said: “Yes; do as you have said.”	ה וְאֶקְחָה פַת-לֶחֶם וְסַעֲדוּ לִבְּכֶם, אַחַר תַּעֲבֹרוּ–כִּי-עַל-כֵּן עֲבַרְתֶּם, עַל-עַבְדְּכֶם; וַיֹּאמְרוּ, כֵּן תַּעֲשֶׂה כַּאֲשֶׁר דִּבַּרְתָּ. 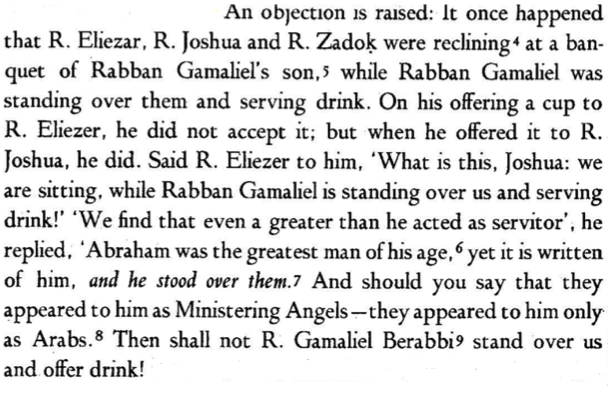 6 And Abraham hurried into the tent to Sarah, and said: “Quick! Three measures of fine flour! Knead it! Make cakes!”	ו וַיְמַהֵר אַבְרָהָם הָאֹהֱלָה, אֶל-שָׂרָה; וַיֹּאמֶר, מַהֲרִי שְׁלֹשׁ סְאִים קֶמַח סֹלֶת–לוּשִׁי, וַעֲשִׂי עֻגוֹת. 7 Abraham ran to the cattle, and fetched a tender and choice calf, and gave it unto the young man who rushed to prepare it. ז וְאֶל-הַבָּקָר, רָץ אַבְרָהָם; וַיִּקַּח בֶּן-בָּקָר רַךְ וָטוֹב, וַיִּתֵּן אֶל-הַנַּעַר, וַיְמַהֵר, לַעֲשׂוֹת אֹתוֹ. 8 And he took butter (or curd/cottage cheese), and milk, and the calf which he had prepared, and set it before them; and he stood by them under the tree as they ate. ח וַיִּקַּח חֶמְאָה וְחָלָב, וּבֶן-הַבָּקָר אֲשֶׁר עָשָׂה, וַיִּתֵּן, לִפְנֵיהֶם; וְהוּא-עֹמֵד עֲלֵיהֶם תַּחַת הָעֵץ, וַיֹּאכֵלוּ. 7 Is it not for you to spread your bread to the hungry, and that you bring the moaning poor to your house? when you see the naked, you should cover him, and not hide yourself from your own flesh? ז הֲלוֹא פָרֹס לָרָעֵב לַחְמֶךָ, וַעֲנִיִּים מְרוּדִים תָּבִיא בָיִת: כִּי-תִרְאֶה עָרֹם וְכִסִּיתוֹ, וּמִבְּשָׂרְךָ לֹא תִתְעַלָּם. 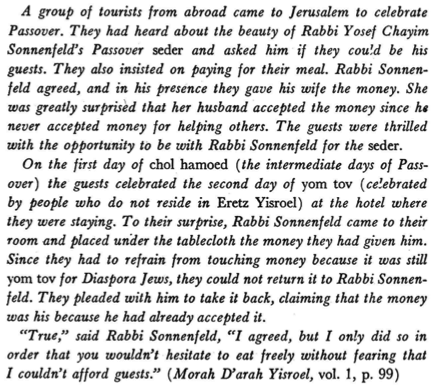 The merit of accompanying [guests on their way] is the greatest of all. And this is a statute that was enacted by our father Abraham, and is the way of kindness in which he conducted himself. One feeds travellers, gives them drink, and accompanies them. And welcoming guests is greater than welcoming the Divine Presence etc. Escorting them on their way is more important than welcoming them in. The rabbis said: Whoever does not accompany is as if he shed blood. From Pliskin, Z; Love your Neighbor.